Upon arriving at what was the ITT Levitt Pledged and Promised Beachside Sheraton; the Prospective Buyers could 'walk through' the Sheraton and go directy on the beach to the shore. 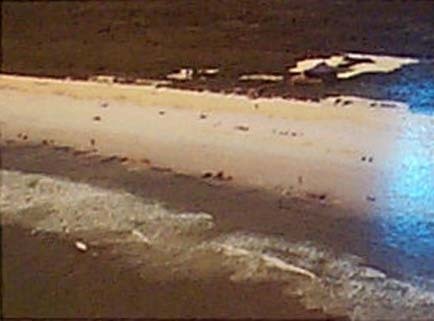 - seeing miles and miles of isolated Beach. Just as at Disney, the Captains of the Boat Shuttle Taxis would engage in conversation with the potential patrons discussing 'Highlights' of the Area. On several occasions they mentioned that this Belle Terre, a.k.a. Bon Terre, and Bon Terra Site was a Paleontological Site and an important Archaelogical Site and listed in the Florida Vertical Files. They highlighted that fortunately because of Palm Coasts Conservation and Preservation Position that this valued Archaelogical Site was protected. They also said this was further noted in the 1974 Comprehensive Land Use Plan from ITT's Paperwork when their Archaelogists/Engineers examined the Develpment initially and more thoroughly. They also told us the Smithsonian had been here in the 1l960's. .
Pllease Note: there are also references to this Archaeological and Paleontoligal Site in several of the Newsletters of the Flagler Beach Museum. One example is: Volume 8, Summer 2008, Ed. 2. p 6. in 'The History Corner' 'Mammoths in Flagler County. http://www.flaglerbeachmuseum.com . Standing on the Boat Dock , this Vantage Point shows where one of the 'Waterfalls' was - upper left of picture. From this vantage pont, standing directly in front of the Large Bench Seating, you can see the two sets of lighted steps leading UP towards where the Welcome Center Tower was. Standing atop the Clubhouse Drive Bridge today you can see where both 'Waterfalls' were once located. Each to the Right and Left of what little is remaining of both sides of the Arrival and Departure Dock areas. 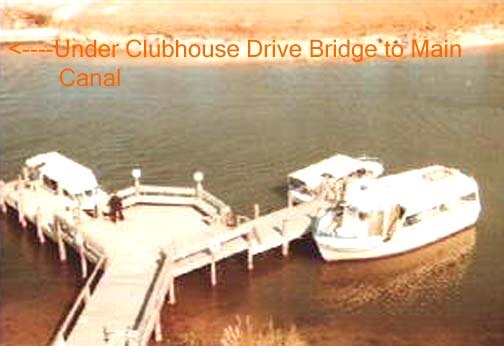 The Boat Shuttles would arrive and depart then go UNDER the Clubhouse Drive Bridge making almost a direct RIGHT into the Main Canal. 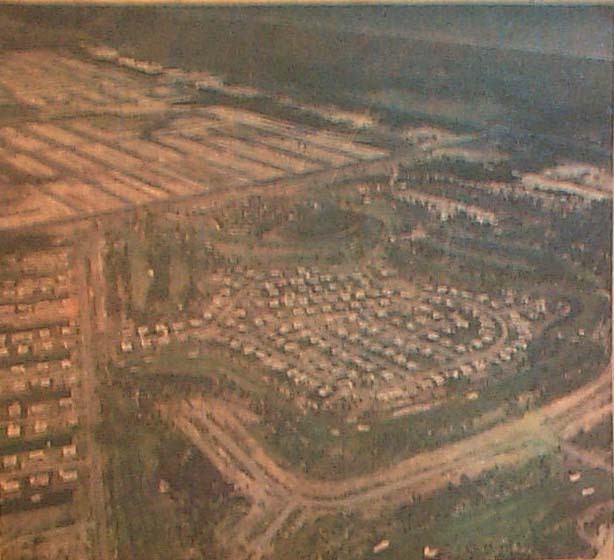 Additionally, early on, the Boats Shuttles went also to the LEFT, to the Palm Harbor Boat and Golf Dock. Prospective Buyers were taken by Boat Shuttle from the Welcome Center to the Dock to view the location of the Palm Coast Golf Course, a.k.a. Palm Harbor Boat and Golf Dock. Early on the ' Contemporary Clubhouse' was not completed but, nine holes had been. Consequently, once completed, the Prospective Buyers could walk from the Boat & Golf Dock past the Putting Green and go directly to the 'Contemporary Clubhouse' for Drinks and Food or return for the rest of the official 'Guided Tour'. Once completed, a few of the early residents used their own watercraft, threw in their Golf Bag, and cruised to the Clubhouse to play Golf. Remember, early on the Canals were *plugged' but there were still early Residents who had their own watercraft in anticipation of the unplugging, thereby, providing access to the Intracoastal. 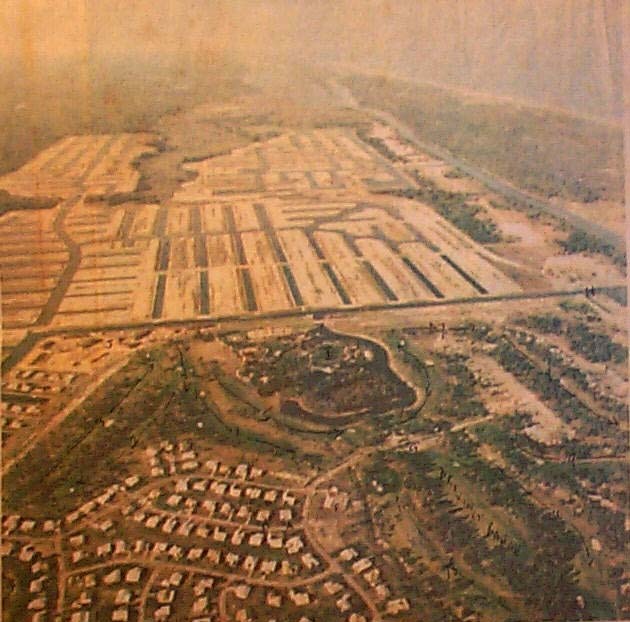 Atypically the Prospective Buyers were brought here also, however, early residents used their personal watercraft to bring their club to play Golf at the Palm Coast Golf Course, later known as the Palm Harbor Golf Course. Early on this was also part of the 'Companys' official 'Guided Tour' for Prosepective Buyers. The Prospective Buyers Sales were *nailed* when some saw they could Boat and cruise over to play Golf without having to use their cars. 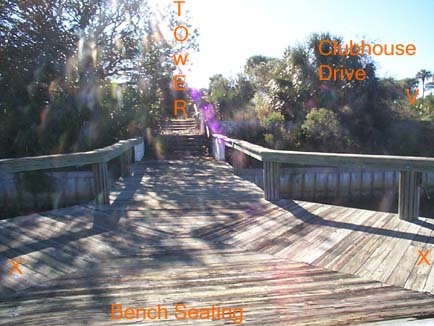 The Prospective Buyers, once having viewed the Golf Course, the Putting Green, the Driving Range, and the 'Contemporary Clubhouse' atpically were taken back towards the Welcome Center Tower and/or to continue the Boat Tour to the Beachside Sheraton. Please Note: in the 1978 Section how the 'Boat to Golf' Dock was presented. Great Business Acumen! View standing on wallkway of the Clubhouse Drive Bridge. 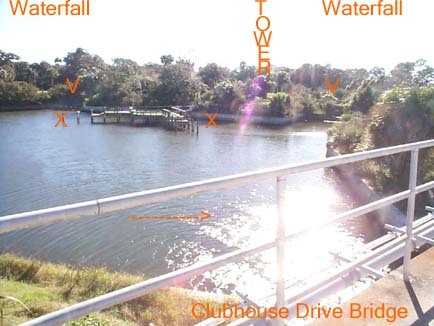 The Boat Shuttle would arrive and depart from the Dock and go UNDER the Clubhouse Drive Bridge making almost a direct right Into the Main Canal towards the Intracoastal Waterway. This is a view from atop the Clubhouse Drive Bridge. The Boat Shuttles would travel UNDER this Bridge then make a Right onto the Main Canal to the Intracoastal Waterway. In the middle of the Snapshot above you will see Clubhouse Drive running left to right. 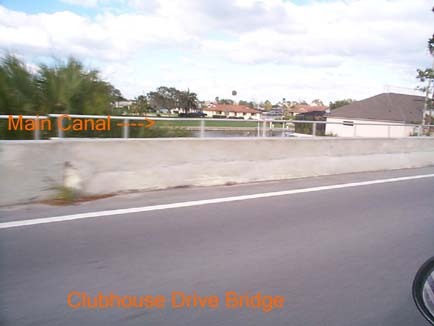 In the Middle of of the Snapshot is the Clubhouse Drive little Bridge. 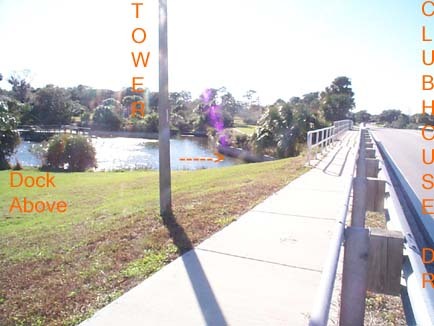 The Boat Shuttles would then go into the Main Canal to the Intracoastal Waterway to the Belle Terre Boat Landing. "X" marks the spot of the Belle Terre Boat Landing. We think this has also been referred to as *Bon Terra* or the Bon Terra Boat Landing. "Y" marks the spot of the then 'proposed' New Bridge. Early on the White and then the Palm Coast Blue Tour Vans would then pick the Prospective Buyers or Retirees up at *(Bon Terra)* - the Belle Terre a.k.a. Bon Terre Boat Landing and Visitors Center. 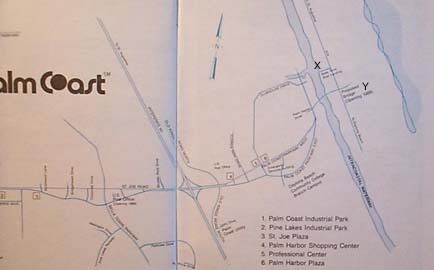 In the upper right quadrant is the area where the at first White then later Palm Coast Blue Vans picked up persons from *( Bon Terra)* - Belle Terre Boat Landing on the Intracoastal Waterway and then shuttled them to the Beach. At the Beach was the Beachside Sheraton Palm Coast Resort. Here the vans would stop and you could directly enter the Sheraton and go directly to view the Atlantic Ocean Beach of Palm Coast. 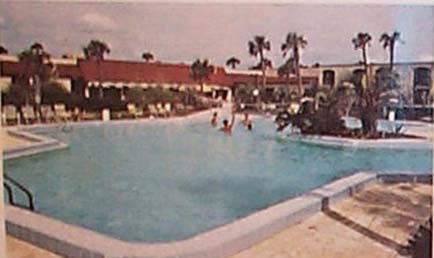 The was what the Beachside Sheraton Palm Coast Resort looked like. This was replaced by development. The Sheraton Palm Coast Resort Inn was located on the Atlantic Ocean Beach about 28 miles north of Daytona Beach on the scenic oceanside highway, State Road A1A. The Sheraton Palm Coast Resort Inn was built in the Old Spanish Mission style, with coquina rocks and was nestled in acres of green, rolling lawn sprinkled with subtropical trees and shrubs with access to five miles of beautiful beach. Each of the 130 Guest rooms had double beds and color television. It had a reputation of always guaranteeing Honeymooners with an ocean view. 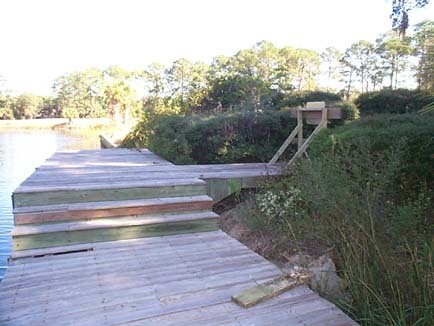 The Ocean was just a few steps away and also close by was the Intracoastal Waterway. On the Inn grounds, there was a large free-form swimming pool surrounded by sundecks. Close by were two tennis courts which were lighted for night play. At the Inn, the cuisine was superb in the Coquina Room or the Cafe del Mar. It also had a Beachcomber Bar, which was located beside the pool. It always offered the finest in mixed drinks and sandwiches. There was nightly dancing and entertainment in the 'Jonkanoo' lounge. 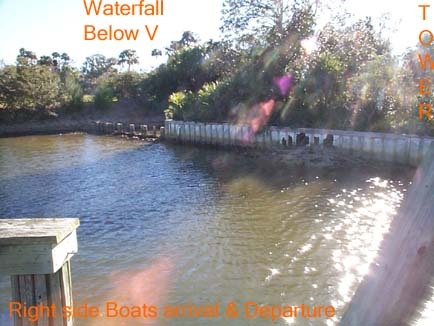 Many Visitors here also took the Boat Shuttle to the then Palm Coast Yacht Club which was across the Intracoastal Waterway. Excerpt from: 'The Palm Coaster', published by the Corporate Communications Department of ITT Community Development Corporation for Palm Coast property owners, purchasers and homeowners, as well as their families and friends. Vol 7, Number 2, Summer 1978, pp. 10-11. 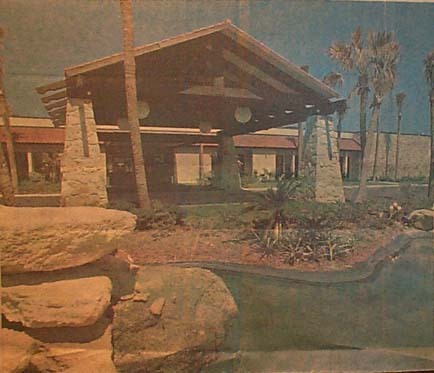 This is a snapshot of what the ITT Levitts' Pledged and Promised Beach Club - the Beachside Sheraton Palm Coast Resort Front Entrance looked like before it was sold and demolished.